A Thursday night at Hendershot’s is an unassuming span, but this night was handily commanded by the Odd Trio, made up of Marc Gilley, saxophonist (of Athens’ funk outfit The HEAP); Todd Mueller, drummer/percussionist; and Brian Smith, guitarist/bassist (of The Georgia Guitar Quartet). The three joyously trotted along through original jazz fusion compositions with equal parts childlike abandon and fearlessness, propelled by a sort of loose discipline honed over years of classical training and plain old sweat. The Hendershot’s crowd seemed intent and respectful, a trend at the coffee/beer and wine spot (now with liquor license I’ve heard!). Maybe that’s why it’s such a fine place to catch some high-quality Athens music: openness, a lack of prejudice, and a general warmth. The place is full of hard surfaces, but on Thursday night a huge number of deep oil paintings by Nash Hogan helped to ease the echoes giving the overall acoustics a welcomed damper. 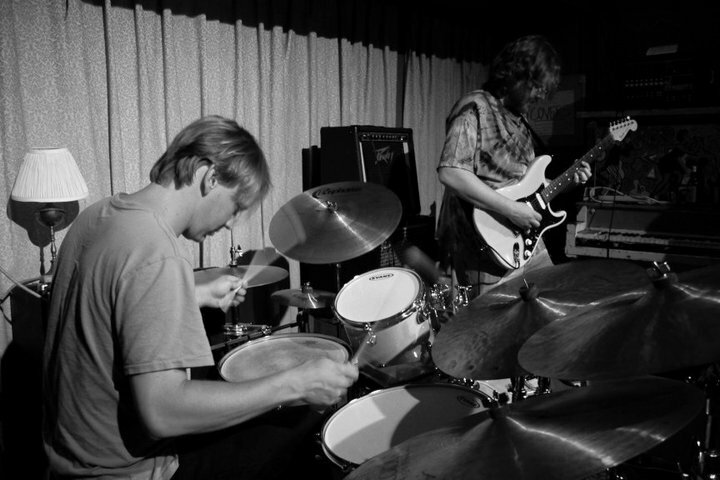 Clearly rooted in improvisation, the Odd Trio’s compositions can venture into territory from hard rock to hard bop, with tangents taking the versatile players into reggae, funk, classic rock, and swing; it’s all there and it’s all as malleable and flowing as hot wax. Put these guys on the West Coast in the late 50’s, and they would have blown Dave Brubeck’s mind past the Bikini Atoll! Brian Smith has, at once, the monstrous dexterity of a classical guitarist and the attitude of a shredder fiend, and it comes through in his every experimental phrase, whether it be effects-laden or straight from his axe to your ears. Behind the kit, Todd Mueller lays a stone foundation while allowing himself freedom to paint with auxiliary percussion; triangles, Tibetan prayer bells, enviable shaker complexes are his friends! As a sax man, Marc Gilley knows and respects the tradition led by the likes of Wayne Shorter, but he, too, uses effects and manipulation to eke out lush and eerie reed sounds you’d never know possible. On that particular Thursday evening, songs like “Accidental Cool” launched into brainy funk with an otherworldly zinging effect that recalled some lost level of Metroid. It’s almost elemental how beats, soaring saxophone, and looped guitar shimmer and streak like beads of mercury on glass. Harmony and dialogue are pertinent yet unpretentious in their playing, but so is frequent grinding, jostling, pushing and pulling like there’s always a localized tectonic micro-plate under the room. For the theme “Indian Summer”, a floating Latin feel served as the underpinning for all manner of stretchy, virtuosic guitar, some of which was so bizarre as to be almost comedic yet unmistakably engaging, too. Never has such a high level of musicianship been this much fun to hear and witness. To look at the faces in the tight-knit crowd was to realize that the Odd Trio brings as much intense joy to the stage as they do proficiency, beauty, and originality. The night’s closer was a crackling, syncopated tune called “Lo-Fi Hi-Jump” (rumored to be the title track of a forthcoming release!) and its bass riff was one that was still in my head the morning after. On tenor sax, Gilley assailed the crowd with a wail like a Comanche war cry, while a sort of Jamaican vamping on guitar bled into a demented, postmodern waltz. Mueller claimed a delirious, metallic march to finish the set, and the audience was left with wide smiles, conveying an evident hunger for the next sonic ride. Don’t miss the next chance to make it to Hendershot’s. Catch the Odd Trio and partake in a decidedly enjoyable couple of hours, gratis: Thursday, Feb. 24th.